On Monday, the US State Department "was pleased to support" the seizure by Venezuelan opposition forces of three buildings in the United States belonging to the Venezuelan government, State Department spokesperson Robert Palladino said. Self-proclaimed Interim President of Venezuela Juan Guaido's envoy to Washington, Carlos Vecchio, told Reuters the opposition had gained control of two buildings in Washington, DC, belonging to the Venezuelan Defense Ministry as well as a consular building in New York. Vecchio said they expected more such seizures "in the days to come." The move follows a statement by Guaido on Saturday claiming "we do have control over Citgo," the US subsidiary of Venezuela's state-owned oil company PDVSA, "and a license to continue the company's activities," Sputnik reported. In late January, the US moved to block $7 billion in revenue from returning to Venezuela. Last Thursday, the US Treasury extended Citgo's license for another 18 months, enabling it to collect money for Guaido's opposition movement, "while prohibiting any benefit from flowing back to the illegitimate Maduro regime," the Treasury said. Other assets owned by the government of Venezuelan President Nicolas Maduro have also been seized since January 23, when just three days after Maduro began the second term he was elected to, Guaido, with US backing, declared himself president instead. In early February, the Bank of England froze $1.56 billion in gold assets owned by Caracas following a request by Guaido for London not to permit their repatriation. 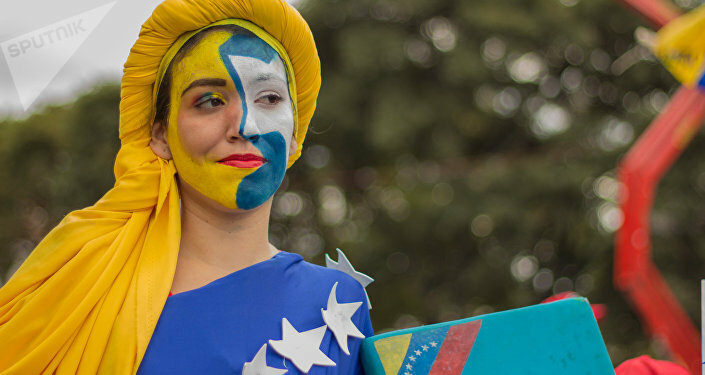 Radio Sputnik's Loud and Clear spoke about the situation in Venezuela with Gloria La Riva, the director of the Cuba and Venezuela Solidarity Committee, who just returned from a month-long stay in the country. ​"They've already seized Citgo in the United States, and very likely gave instructions to England, its ally, to not release the gold that is the property of Venezuela… which they need immediately for liquidity. But, on March 1, Dulcy Rodriguez, the vice president, did announce that the Portuguese headquarters of PDVSA, the oil industry, has been moved to Moscow to protect it, and they are working much more closely together to find a way that Russia can invest more fully in the oil operation," La Riva said. "I think the US media will continue to churn out lies, the most incredible accusations, in order to soften up and make it difficult for people to oppose US military actions and economic actions," she said. "The sanctions are what are causing the crisis in Venezuela. I mentioned ‘crisis' to somebody there, some of the women who were working in the food distribution. They said, ‘It's not an economic crisis, it's an economic war against us.' We need to make that clear. And the danger is there: the dangers of US war," which La Riva mentioned means both military intervention but also the rise of paramilitary proxies, such as the US has supported in many other Central and South American countries. However, despite these moves to strangle Venezuela's economy and to portray its society as chaotic and inadequately governed, La Riva, who spent most of her recent trip in the capital city of Caracas, said, "Venezuela looks very normal." "It's modern; there's many people in the street," she said. "Until the blackout, the transport was working, the metro was free, packed with people traveling to work and elsewhere. All the shops are open; the stores are full of food — every kind of store, the super modern markets down to the smaller neighborhood stores. Of course, there's the issue of prices, in the larger private stores, and we can talk about that, but food is readily available everywhere." "I think the most interesting thing is, besides the national food distribution program to 6 million families, meaning about 24 million people in Venezuela" out of a total population of 31 million, "that there are many, many sellers of fruits and vegetables in the street, at affordable prices," La Riva told hosts John Kiriakou and Brian Becker. La Riva said she was due to fly out of Caracas the night the power went out for the first time, and the outage kept her there for another four days. "That first night, I was extremely worried. I said, ‘Are they going to try and kill President Maduro? Is there going to be troops on the ground? What's happening?'" The next morning, she found out it was sabotage, and said the power winked in and out for days, but despite the instability, hospitals had their own backup generators and were able to weather the storm. However, while the official investigation continues into the cause and origin of the blackout, which shut down the Guri dam in Bolivar state, and along with it 73 percent of Venezuela's electrical output, the consensus seems to be it was some form of cyber attack. "It still has to be filtered out, but Venezuela says they will present this to the United Nations. I think it will take some time, " La Riva said. However, the power problems persist. Sunday night into Monday, another blackout struck parts of Caracas, the cause of which is as yet unknown, Sputnik reported. Following a transformer explosion in the hills outside Caracas Monday afternoon, a wildfire erupted on the hillside that further endangered other electrical cables, observers noted. However, the fire was mostly extinguished by nightfall. ​La Riva cautioned that the official story touted by Washington and the mainstream media about the outage might change, too. "There are already two disclosures after initial accusations, as you know: the New York Times showing that the accusation that Maduro ordered the burning of the humanitarian aid — so-called — trucks on the bridge on February 23, caused by the fascists who were lobbing Molotov cocktails." "But there's also the admission that the drone attack was an assassination attempt… on August 4 of last year. US officials said, ‘Oh, he's trying to just claim an assassination attempt so that he can get more support.' Well, in fact was. It was based, the planning, the setting up of the drone and the bombs in the drone, in Colombia," she said.